Image description: A box with header in teal blue with white writing: Mum’s Professional Title Generator. 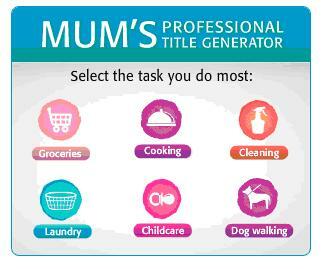 Underneath six coloured dots on a white background (pink, purple, orange, and teal blue dots) with a white picture on each dot – a shopping cart, a covered plate, a spray bottle, a laundry basket, a baby pacifier and a dog on a lead – with a one word description of each image underneath – groceries, cooking, cleaning, laundry, childcare, dog walking. You click on the task that you perform most often and it gives you a title. There you go Mum, now you can hold your head high. *this ad was appearing on the front page of the SMH today, but seems to have disappeared for a while. Struggling to have a coherent reaction to this one, beyond ARGHHHH!. Oh, but “get angry at mysogynist claptrap” is not on list! Where’s the “all of the above and more” button? Or the “wtf, you have a low opinion of what I do” button? Which company was this, so I know not to buy anything from them? wtf, have they never heard of a time use survey? or the fact that women often undertake tasks, you know, simultaneously? maybe they’ve never done housework so they don’t understand … oh look, I give up! This is ridiculous, full stop.